FOR USE ON COOLER CLIMATE GOLF COURSES, SPORTS FIELDS, PARKS, and LANDSCAPES. With its excellent durability, fine texture, and great wear tolerance, West Coast Turf’s 100% rye is the sod-of-choice for classic all rye golf courses. Because it can tolerate close mowing, it is perfect for creating contrasts in texture. It also exhibits strong density. 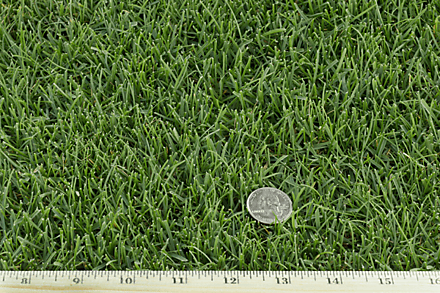 Dense growth habit provides for excellent durability and wear tolerance. Vigorous growth habit allows quick recovery from injury. Tolerance of close mowing and a wide range of mowing heights makes 100% rye very versatile. Broad genetic base provides excellent resistance to common turf diseases. Can grow in a wide range of soil types. Thrives in cool, to warm climates USDA zones 3-8. ¼-2” with a reel mower. List of optionsRegular sod: Comes in 16” x 72” rolls with ½” of soil. Each weighs approximately 45 lbs. Great for normal conditions.